I pull nail art inspiration from everything from nature to architecture to graphic prints, but I guess I shouldn't be surprised that a lot of my inspiration still comes from the beauty world. (Case in point: my Marc Jacobs Daisy Dream nails, and FYI I have another Marc Jacobs-inspired nail post coming soon!) When the holiday Steampunk Ball set from butter London popped up on my Instagram feed, I instantly went YES, DOING THIS and took a screenshot. I just love the look of all the gears and cogwheels; butter London is amazing at making covetable polishes and packaging. I started out with a base of Sally Hansen Xtreme Wear in Black Out as the base (two coats), then topped it with L'Oreal The Matte Velvet, a mattifying top coat (I love this one for the not-super-flat finish.) Next, I painted in the gears and cogs with Orly Luxe and China Glaze Gossip Over Gimlets. butter London seems to use only one shade of gold on the packaging, but I thought it would be fun to have a two-tone thing going on. For the longest time, I just could not figure out why my gears made me think less steampunk-industrial and more weird metallic flowers. 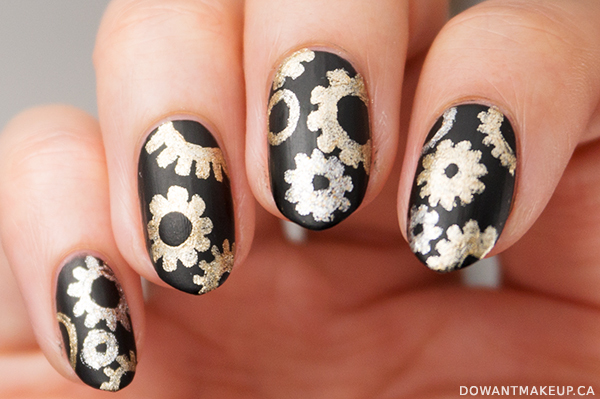 I realized that I painted the teeth on my gears (called cogs apparently; thanks Wikipedia!) way too closely together--these gears are definitely just for show because they can't mesh together with other gears haha! I've since found out that butter London has a whole Steampunk Ball collection, including a set with rose-gold gears, so I might try this again and pay a little more attention next time. What's a holiday beauty set that's caught your eye lately?